If you need to dress to impress clients or prospects, or just need a new suit, shirt and tie combo for a special occasion, TM Lewin has you covered. TM Lewin was established in London's famous Jermyn Street in 1898 and has a reputation for crafting both ladies' and gents' corporate wear of the highest quality at excellent prices. 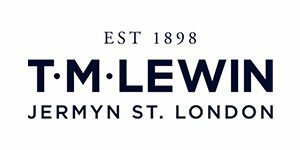 TM Lewin is offering Access1st users a 15% discount on all full-price items they purchase online or in store - plus a 10% discount off any sales items. If buying online: you can redeem the discount by entering code AUAJG17 at the checkout. If buying in-store: Download the latest special offer flyer here and present in-store at point of purchase. This flyer is valid until Sunday 24 December 2018. Updated flyers will continue to be added to this page, and special offers will continuously be available to Access1st users. If you are unable to print the flyer, you can present it on your phone at point of purchase to obtain the discount.